Ben Manciewicz referred to this as an “allegorical morality tale,” heavily laced with understated mysticism. It was the second movie directed by Clint Eastwood, his first western as a director, and the movie by Eastwood that most overtly shows the influence of Sergio Leone, one of his mentors. This first shot is Leone-esque, with a lone rider approaching the camera from a distance through a haze. (There will be a bookend of that shot at the end of the movie, with the lone rider leaving at a distance into a similar haze.) Clint Eastwood is the Mysterious Stranger, one of his specialties, and, as with the earlier Leone trilogy, he is never really named. He rides into the mining town of Lago (“Lake”), where the general vibe is fearful and unfriendly. After an initial drink, he goes to get a shave and bath. At the barber shop, three thugs insult and attack him until he shoots all three of them. Outside he is repeatedly insulted by Callie Travers (Marianna Hill); he drags her into a stable and rapes her, although she appears to get into it. The Mysterious Stranger rides in. The Stranger is not a typical western hero, but a morally ambiguous man given to cruelty. He also rapes Sara Belding, who deserves it even less than Callie Travers, but who similarly seems to get into it. Some of the townspeople turn on the Stranger, and he blows up three who try to kill him in his hotel room. He shoots and wounds at least one of another group of assailants, who escapes out of town only to be killed by the three approaching outlaws. The Stranger sets up the town’s defenses but leaves before the outlaws arrive. Lago, now painted bright red, waiting for the outlaws. [Spoilers of a sort follow.] The citizens are unable to carry out the Stranger’s plan, and the three outlaws take over, with several of the townspeople being shot or otherwise killed. With much of the town in flames, as the outlaws drink in the saloon a whip comes out of the night and drags out one outlaw standing near the bat-wing doors. Sounds of him being whipped to death are heard, and we see his body lying in the street. As the two remaining outlaws hunt the source of the whip, it comes from above, wraps around the neck of one and lifts him off the ground, hanging him. That leaves only the outlaw leader Stacey Bridges (Geoffrey Lewis), who sees the long-coated stranger, pulls a gun on him and is shot several times for his pains. As the Stranger leaves Lago, he passes the sign where the town name “Lago” has been painted over in red with “Hell.” Mordecai is putting the final touches on a tombstone in the local cemetery as the Stranger rides past. Mordecai says, “I still don’t know your name,” and the Stranger responds, “Yes, you do.” And the camera shows that Mordecai’s tombstone reads “Marshal Jim Duncan,” who no longer has an unmarked grave. Among the other graves near Duncan’s are those of S. Leone, Donald Siegel and Brian G. Hutton (director of Where Eagles Dare and Kelly’s Heroes)–all directors of films Eastwood has appeared in to date. The Stranger rides off into the haze, just as he came. 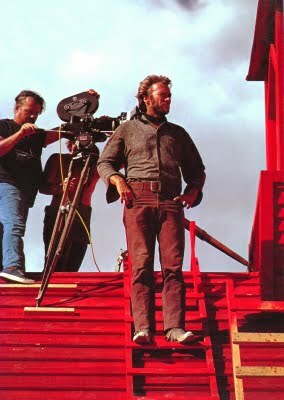 Director Eastwood setting up a scene from the top of a red building; horsing around with Mordecai (Billy Curtis) behind the scenes. The identity of the Stranger is left ambiguous. One version of the script had him as Duncan’s brother, but Eastwood liked the ambiguity of not being too explicit and took that reference out. The Stranger is a figure of heartless retribution for crimes left mostly vague, not an admirable hero. Echoes of this Stranger will reappear in kinder and more sympathetic form in Eastwood’s Pale Rider more than a decade later. The camera work (the long shots of lone riders, the frequent tight 2/3-face closeups) are reminiscent of the spaghetti westerns that made Eastwood’s movie career, as are other surreal touches, such as the dwarf. The heavy ambient noises (the hoofs of the Stranger’s horse, the constant sound of the wind, the disproportionately loud jangle of the Stranger’s spurs, for example) also make it seem like a spaghetti western. It is the most existential and supernatural of Eastwood’s works as director. While not his strongest western, it’s a cult favorite in some circles. It confirmed him on his path to becoming a major director. 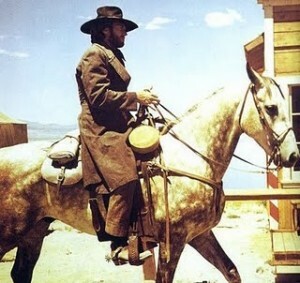 He brought High Plains Drifter in two days ahead of schedule and under budget, and it was one of the highest-grossing westerns of the 1970s. 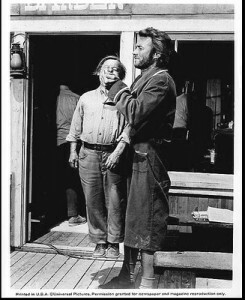 His next western would be the classic The Outlaw Josey Wales (1976). He was a bright spot in a decade not otherwise known for westerns. His star was rising as John Wayne’s was fading (The Cowboys  and The Shootist ). Shot on location at California’s eerie Mono Lake, 300 miles from Los Angeles on the Nevada border. Bruce Surtees was the cinematographer. Written by Ernest Tidyman (Shaft, The French Connection). 105 minutes. This entry was posted in Westerns Worth Watching and tagged Clint Eastwood, Supernatural Westerns, The Mysterious Stranger on June 9, 2014 by Nicholas Chennault. 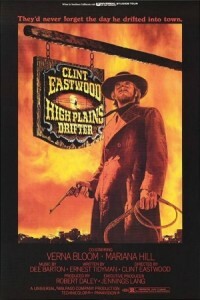 The first time I saw High Plains Drifter was probably in the late 1970s. Clint Eastwood stars in and directs the film. Most westerns are either about cattle drives or cowboys and Indians. 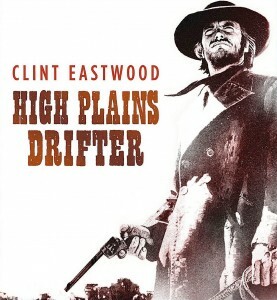 High Plains Drifter is different: this is a God’s-Judgment-on-the-wicked western. The stranger rides out of the town of Lago past the cemetery. This little guy named Mordecai is writing something on a grave marker. There is a lot of sin (unrepented sin) in the United States and in the world. When people continue to live in sin, eventually God’s Judgment falls. The more people try to hide their sin, the greater God’s Judgment. The people of Lago tried to hide the murder of Marshall Duncan, but their sin was found out. You can’t hide from God. “When the Stranger says: ‘What is the meaning of this city? “Oh my soul, be prepared for the coming of the Stranger. Marshall Jim Duncan was whipped to death; Jesus Christ was at least nine-tenths whipped to death. The stranger riding into Lago (the first scene of the film) is a symbol of the Second Coming of Jesus Christ: not as the Lamb of God, but as the Lion of the Tribe of Judah.